Act 3 of the current Extreme 40 World Series of high performance stadium style regattas, offered spectators the kind of visual thrills that even Formula 1 Grand Prix and motorcycle racing can hardly match. If it was the intention of the series organisers to bring yacht racing to a new level that captures the imagination of watching crowds and online video viewers, they certainly seem to have succeeded in the three events staged so far. 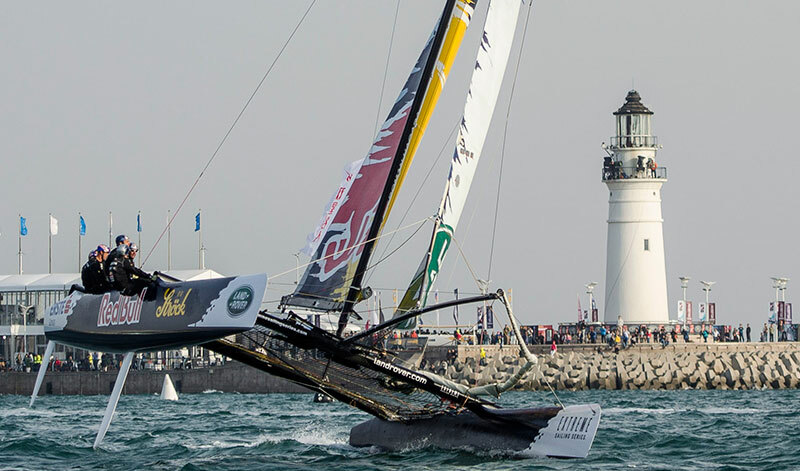 And none more so than in ‘no holds barred,’ high adrenalin dual that took place during early May, in the former Olympic sailing city of Qingdao! On the final days racing at the Land Rover Extreme Sailing Series™, Act 3 the city course lived up to its reputation as a notorious and unpredictable challenge even for the best sailors on the planet. It even had one of the biggest crashes in the Series’ eight-year history, that saw Red Bull Sailing Team T-bone Alinghi, and knock the Swiss out of racing. But this couldn’t stop the team of Morgan Larson, Anna Tunnicliffe, Nils Frei, Pierre-Yves Jorand and Yves Detrey. Eventually they took the victory despite watching the final races from the dock, after the international jury awarded the Swiss boat a redress, to helmsman Larson’s great relief. On the final day, Britain’s sailing hero Sir Ben Ainslie and his crew showed the gold medal winning form that they have been struggling to find so far, with two race wins.